Accuray Incorporated has announced that Daniela Schmitt, PhD, a medical physicist at Heidelberg University Hospital, took top honors in the overall category of the 2018 TROG Plan Study: Stereotactic Radiosurgery (SRS) Brain, with a plan she created using the Accuray Precision Treatment Planning System. Dr. Schmitt developed a plan for delivery on the CyberKnife M6 System, a device designed from the ground up to deliver SRS treatments with precision and accuracy, and without an invasive frame. The study, hosted by TROG Cancer Research and ProKnow, received 160 entries from clinicians around the world. Of these submissions, only 10 percent were plans produced by the proprietary Accuray Precision System or the MultiPlan TPS for the CyberKnife platform, while the remaining 90 percent were created using treatment planning software for other delivery systems, making a win by a physicist using Accuray TPS even more impressive. The goal of the study was to quantify the capabilities of different planners and delivery modalities to create high-quality treatment plans for a challenging SRS case with five small brain metastases. The plans were scored based on target coverage and organ-at-risk (OAR) sparing, defined by specific metrics. Evaluation of the plans was objective and transparent with real-time scoring and analysis. For more information on the plan study, register at ProKnow by visiting https://proknowsystems.com/planning/studies/5a0f6aa074403fbcc665424c1b13eaf2/population. "It was a great experience to compete with all available systems for SRS treatments," said Daniela Schmitt, PhD, department of radiation oncology, Heidelberg University Hospital. "We often use the CyberKnife to treat patients with multiple brain metastases and now have confirmation of our good clinical practice. Treatment planning studies like this can help the whole community to find the best solution with their systems and to achieve the best daily clinical treatment plans based on the lessons learned." The Accuray Precision System is a powerful, full-featured treatment planning system, enabling clinicians to efficiently generate high quality radiation therapy treatment plans for all SRS and stereotactic body radiation therapy (SBRT) cases delivered by the CyberKnife System. "We congratulate Dr. Schmitt on the creation of an outstanding plan. Her achievement demonstrates what is possible when clinical skills are partnered with innovative technology," said Lionel Hadjadjeba, M.D., Senior Vice President, and Chief Commercial Officer at Accuray. "The Accuray Precision System represents an important step forward in our treatment planning capabilities. When combined with the CyberKnife M6 System the resulting precision, versatility and efficiency make these technologies an ideal choice for the management of multiple brain metastases, an indication increasingly being treated with SRS." The CyberKnife System is routinely used to treat conditions in the brain, including, but not limited to, benign and malignant primary tumors, brain metastases, trigeminal neuralgia, acoustic neuromas and arteriovenous malformations (AVMs). The system enables the clinical team to achieve maximal sparing of brain tissues involved in important functions such as hearing and vision. 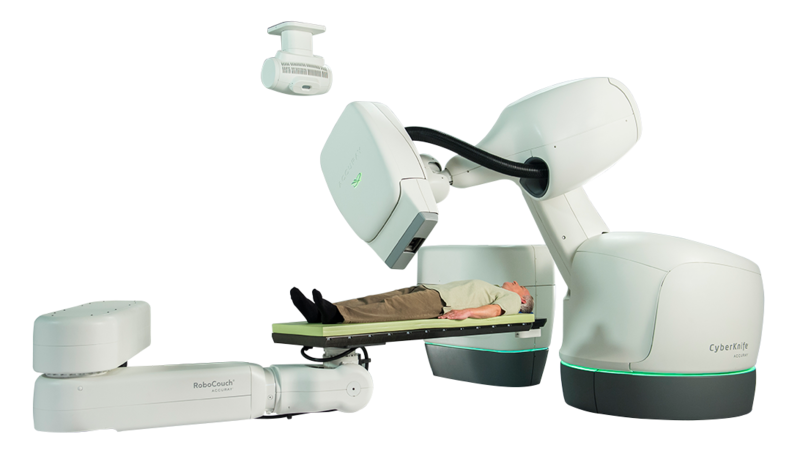 Accuray CyberKnife customer earns top score in multiple brain metastases in TROG plan study. Appl Rad Oncol.